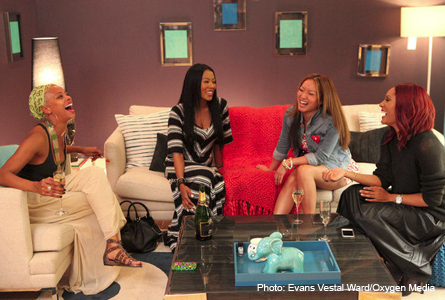 AMERICA’S NEXT TOP MODEL: Eva Marcille’s New Reality Show! “America’s Next Top Model” premieres cycle 19 tonight on the CW! Our interview with cycle three winner below about her new reality show! “America’s Next Top Model” former winner, Eva Marcille who competed on the Tyra Banks model competition reality show in it’s third cycle will be introducing reality show audiences to her three best friends as they live their lives in Los Angeles in “Girlfriend Confidential: LA” on Oxygen network. One friend is an interior and product designer Nikki Chu, another one, Kelly Marie Dunn is a talent and brand manager and her other friend is an actress with behind-the-scenes experience Denyce Lawton. We got the chance to talk to Eva and Denyce about the reality show aspect of the show during an interview. Marcille commented on the new season of “America’s Top Model” to the new contestants by stating “lucky you…that new judge is drop dead gorgeous. Oh my God where was the man candy when I was on ‘Top Model.” She said that after winning the competition that Tyra Banks along with Benny Medina both managed her. Although she left this management team in 2006 to pursue her acting career, Marcille said she still has a really good relationship with Banks. She credited, “what I do today is definitely because of Tyra. She’s one of my biggest mentors when it comes to being a business woman and putting your business hat on first then your model lipstick”. Eva Marcille (standing) with real best friends. “On the production side which is why I would not do the show unless my best friends signed on, was that I wanted it to be as real as possible. Working on America’s Next Top Model was lucky because it was a competition based show so there’s not much room for fabrication. However when you do a docu-series just based on someone’s life it can be completely produced. I wanted to make sure that those people that are the real reason why I’m successful. The real reason why I’m grounded. These are my real friends and real situations. Not a mock-up”. “Girlfriend Confidential: LA” two of her friends are camera shy! When asked if she helped her two friends Kelly Marie Dunn and Nikki Chu who are not used to being in front of that camera as herself and Denyce are, with being comfortable on the set of “Girlfriend Confidential: LA” in front of the camera, Marcille stated, “We actually did a really good job with helping Kelly, helping her on camera. Because Kelly Marie Dunn is really, really shy and pretty proper and always straight-forward. Denyce definitely was a producer on this. Helping message Kelly and making her comfortable on camera”. Dencye confirmed, “She (Kelly) is someone who doesn’t believe in unsolicited advice. And with reality you can’t just sit there and watch everybody go through the motions and not have input. She felt like she didn’t want to say anything inappropriate or anything that would hurt anyone’s feelings or come across as the B-I-T-C-H on the show. So we had to work on that a lot”. “Girlfriend Confidential: LA” premieres on Monday, September 3, at 11pm ET on Oxygen. Marcille walks Sachike Twins Runway Show New York Spring Fashion Week 2012.